Korean restaurants Gaon and La Yeon kept their three Michelin stars in the 2018 edition of Michelin Guide Seoul. 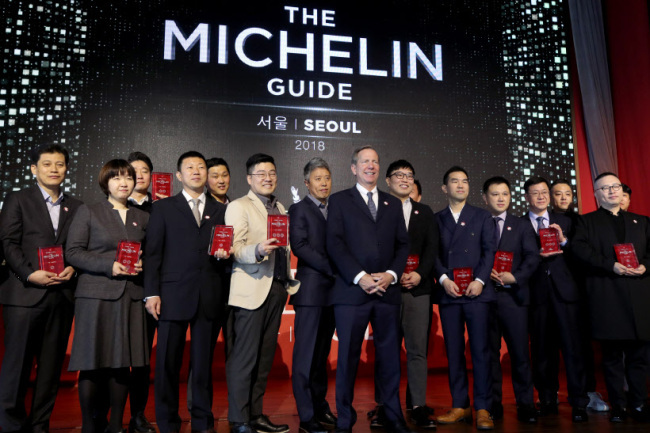 Michelin released the second edition of the Michelin Guide Seoul at a press conference at Signiel Seoul in Seoul on Wednesday, awarding the coveted Michelin stars to a total of 24 restaurants. Two new restaurants joined the ranks of the two-star restaurants -- Kojima-Sushi and Jungsik, a modern Korean restaurant which moved up a notch from last year’s one Michelin star-- while Gotgan and Kwon sook soo renewed their two-star status, bringing to total four restaurants in Seoul with two Michelin stars. “This year’s Seoul edition revealed how dynamic and exciting Seoul has become as a dining scene. There is a lot of culinary talent here,” said Michael Ellis, international director in charge of the Michelin guides. A total of 18 restaurants made it to the list of one-starred restaurants, of which four are new -- Exquisine, Dosa, Joo Ok, and Table for Four. “The presence of newly starred restaurants means that (the) culinary scene here is really evolving,” said Ellis. While the restaurants that earned three and two Michelin stars specialize in Korean food, whether traditional or contemporary, except for one, Kojima-Sushi, the offerings at the one-star restaurants are more varied. Five restaurants, including Exquisine, Dosa, Soigne, Alla Prima and Zero Complex, bill themselves in the innovative cuisine category. Korean cuisine fared well at one-star level as well -- Korean contemporary restaurant Mingles, Bicena, Joo Ok, Keunkiwajip and Poom. Balwoo Gongyang, which serves Korean temple cuisine, was also given a one-star rating. French restaurants are represented at the one-star level by L’Amitie and Votre Maison, while Dining in Space was recognized for its French contemporary cuisine. Pickings for other cuisines were slim: Ristorante EO serving Italian contemporary, Table for Four offering European contemporary and two Chinese restaurants, Yu Yuan and Jin Jin, joined the list. Inspectors from several countries, including Korea, were involved in the selection of the restaurants. “They are full-time, salaried Michelin staff,” said Ellis in describing the food experts that have restaurateurs and chefs around the world on edge as the time for the unveiling of the annual list draws near. “We tried our best every day to keep our dreams alive. The past year has been a valuable time during which we grew together and it is an honor to receive recognition for all our hard work,” said Lucia Cho, president of Gaon Society, whose two Korean restaurants, Gaon and Bicena, earned three stars and two stars, respectively, for the second consecutive year. Around the world, there are 20,000 Michelin-starred restaurants in 28 countries. There are 400 two-starred restaurants and about 100 three-starred restaurants. The restaurants are judged according to five criteria -- quality of ingredients, the skill in their preparation and the combination of flavors, chef’s creativity, consistency throughout the menu and consistency over time, according to Ellis. “The quality of the Michelin-starred restaurants are consistent around the world,” said Ellis. In addition to the Michelin star restaurants, this year’s Michelin Guide Seoul includes 48 restaurants that were awarded the Bib Gourmand, a distinction given to establishments offering a quality menu for 35,000 won and under. Seventeen of the Bib Gourmand restaurants this year are newly awarded, reflecting the diversity of the local cuisine discovered by the inspectors.